Poppy, our little rising star with such a promising future now shining brightly from above. Sometimes it is the smallest things that take up the most room in your heart. Love you always sweet girl. Our sweet pretty girl so tragically taken from us way too soon. We will remember you always Katie. Bred by Cathy Arend on 17 August 2011 in Montana, Monty was a very gentle fun loving boy who sired 3 great litters before passing away suddenly on Christmas Eve 2013. He was so very much loved, we were heartbroken to lose him so soon. May his Spirit roam free on the Desert of his birth place. After siring many lovely kittens Mr H. became a vasectomised boy keeping our girls happy between litters. We were greatly saddened to lose him in September 2013 aged 18 years. He is so sadly missed by us all. Bred by Helen Hawkins, and born in Manchester UK, Linny had a gentle and loving nature and was a wonderful Mum to her beautiful babies. Up until her sudden passing in her 14th year she was a great companion to our stud boy Jimmy. Now resting peacefully at the Rainbow Bridge she is sadly missed by us all. 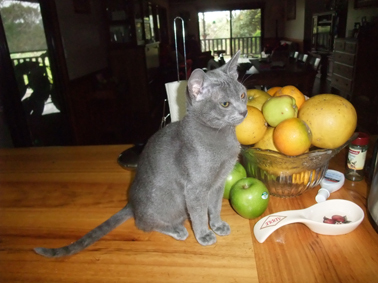 Born in Darwin with the look and colour of the Apple head Siamese ( the result of a recessive gene carried by both her Blue Korat parents) our Princess was certainly a real surprise packet. 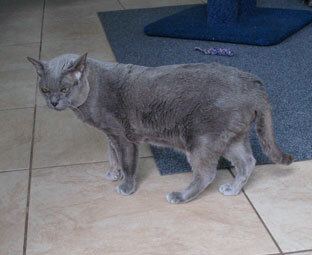 Her characteristics were mostly those of the Korat. 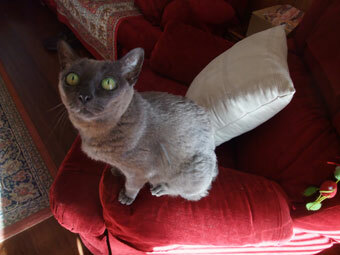 She did not have the typical Siamese vocals however, she was known to cross her lovely Blue eyes if at all stressed. Always energetic and chatty she was Special in so many ways and we were greatly saddened when she passed at 19 years of age. Born in Leicestershire UK on the 21st July, 1991, and bred by Jen Lacey. 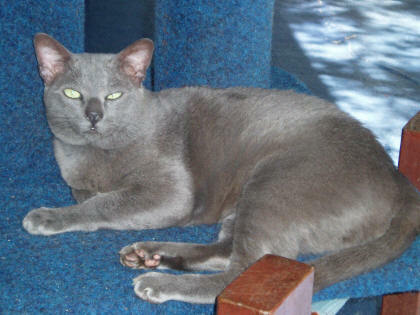 Due to fertility problems, Serena was spayed at an early age and so became a magnificent ambassador for the Korat breed, travelling to shows throughout Australia. 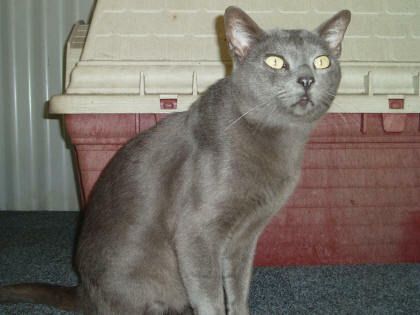 Though often vocal and feisty at shows, her beautiful head shape, eye colour and conformity to the Korat standard won her many Best in Show awards. 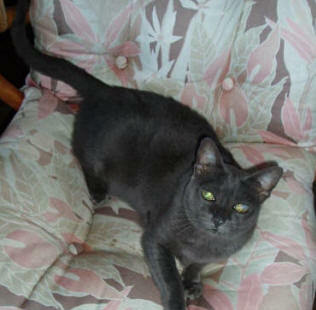 Her retirement years were spent as a loving companion to “Binky”. Finding herself alone after his passing she went to join him just 4 months later on the 18th of June 2012. Two beautiful souls reunited at the Rainbow Bridge but so sadly mourned by their human family. Born in Manchester UK on the 15th July 1995 and bred by Helen Hawkins, Binky had direct import Thai grandparents on his Dam’s side, and his Sire was from old English lines. He had a beautiful, gentle and loving nature and enjoyed being on the show bench where he won many top awards. A very cuddly boy, he especially loved a tummy rub and was always willing to give a soft headbutt to his humans. Our hearts were broken when he peacefully departed this life on the 25th of February 2012, at the age of 16 yrs. His legacy lives on in his many beautiful offspring, and our memories of him will remain with us forever. 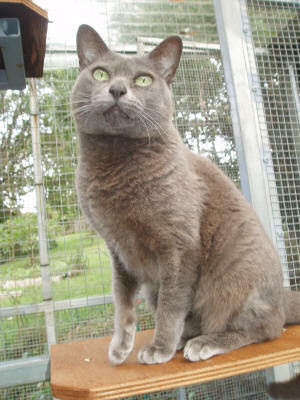 Bo was the foundation stud of our cattery, born in Bristol in the UK on the 4th of December 1989. 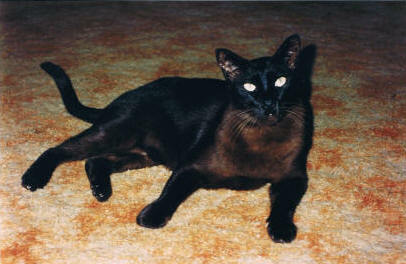 Bred by Muriel Hoskins, he came to Australia as a 6 month old kitten. 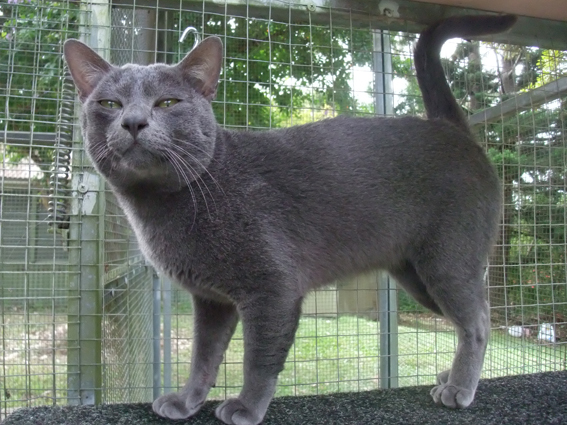 He produced many lovely kittens, many of whom have inherited his beautiful short silver coat and wonderful green eye colour, not to mention his very gentle nature. In his twilight years, he spent his days sleeping contentedly with his two spayed female girlfriends. Bo passed away on the 16th of June 2011 in his 21st year, leaving us with many wonderful memories of a loving and much loved companion along with a legacy that still lives on today in the many kittens he sired over the years. You were part of our family for only a short time, but losing you has left a hole in my heart and soul. I miss our little chats as you followed me everywhere. I miss your flying leaps using me as a launching pad to get into high places. as you would ask to get under the covers by putting your whiskers in my face. You loved your “fishy” and the racket you made while it cooked was quite extraordinary. You brought smiles to my face and joy to my life. Lunar,you are missed so very much. Tragically died on December 13th, 2009 at the tender age of 17 months. Or keep me warm in bed? And beg me to be fed? Or fill that empty chair? 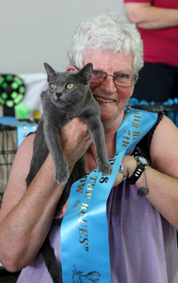 Lees was the foundation Queen of our cattery, born in Manchester (UK) on the 13th December 1989 and bred by Helen Hawkins. 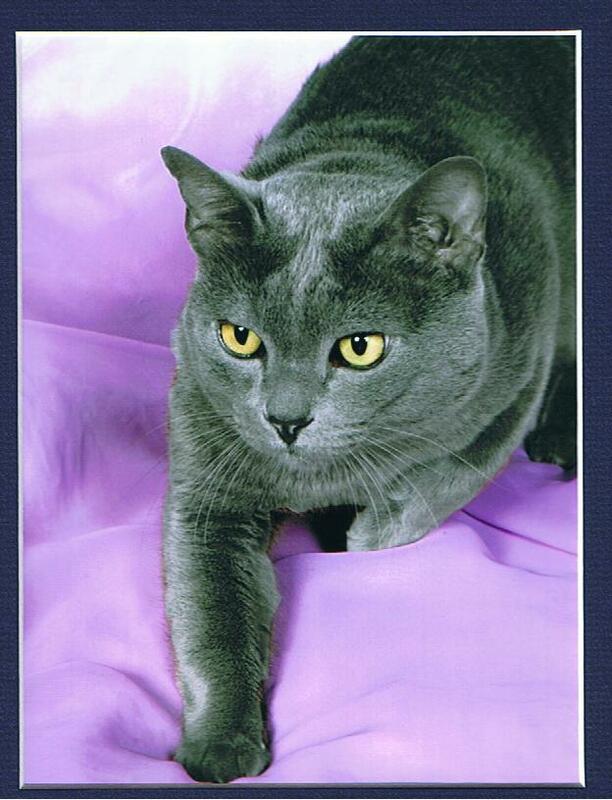 Her destiny was to bring new bloodlines to the depleted Korat gene pool at that time. 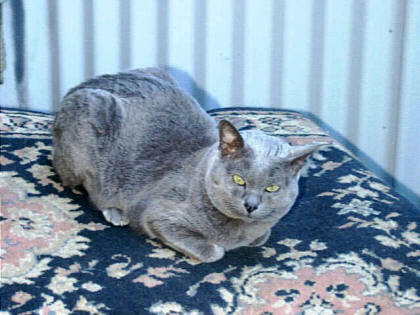 Her first litter with “Charlwin Boeotia “, of 5 females, went to Korat breeders throughout Australia and so began a new generation of Korats, the first in Australia in approximately 30 years. She proved to be a wonderfully caring Mum, never happier than when she had her babies around her. She went on to produce several litters of delightful kittens before being spayed at the age of 6 years. Always a very gentle, loving lady she became our constant companion, always ready for a game and often hurtling up down our passage at a rate of knots. In her twilight years she spent her days resting in the sun on our deck or sleeping on her heat pad in our bedroom which was her domain. Due to Diabetes, her sudden passing on the 17th May 2008 has left a huge void in our lives and one that can never be filled. She holds a very special place in our hearts and her memory will live on forever for those who knew & loved her. Buddy was born on the 23rd August 2007 in Darwin NT. At 3 months of age he was sent to NZ as a breeding stud boy but, after discovering he was being mistreated, I had him returned to me. 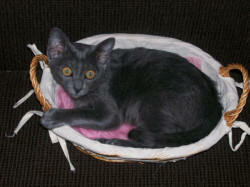 After being nursed back to health, he went on to produce two litters before being neutered. He had some physiological problems from his early life and I could not bear to part with him again, so Buddy became the boy that never left home! He was every one’s friend and he loved to play with young kittens. 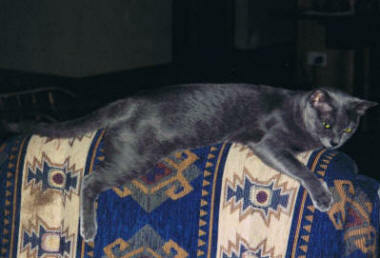 In later years he lived with his daughter, Princess, until his passing of renal failure in December 2007. We miss our Buddy enormously but know that he enjoyed a happy and contented life with us. After Nikki lost his brother Benny he became my shadow for a time until a stray blue cat wandered into our yard and they became friends. 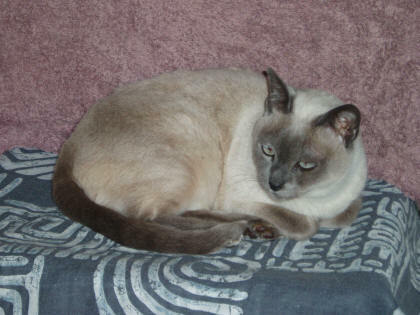 Then when Oscar went to sleep our Thai blue point Princess became his companion. This was to be a beautiful friendship that lasted until Nikki passed away in December 2003 at the wonderful age of 18 years. Both these boys were of a style no longer seen today and both had the very best temperaments. They are both still sadly missed today. 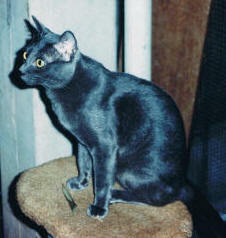 Chula was born on the 9th March 1994. The only survivor of a litter of 4 he was then rejected by his Mum, so I hand raised him until a friend took him and placed him with a newly born litter of Burmese. Prone to stalking and taking a nip of one’s leg at times he none the less became a very competent vasectomised male who kept our girls happy between litters. 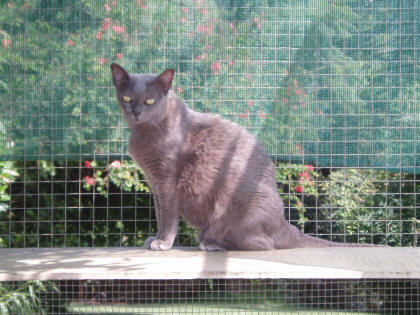 Chula was a very valuable part of our cattery until his passing in 2003, aged 9 years. Born on the 14th July 1995, Thea was bred by Helen Hawkins in Manchester UK and affectionately known as the Manchester Mugger because of her habit of grabbing passers-by by the ankle and hanging on. A half sister to Koorahk Binky’s Boy, she also carried 3rd generation Thai lines on her dam’s side. Being quite large for a female she never quite made it on the show scene but made up for it by producing some amazing litters including two litters of 7. She was especially enamoured of me and had the habit of leaping from the floor onto my chest especially when I had just come in the door with my hands full of shopping bags! Full of character and extremely loving, my life was shattered the day my beautiful Thea passed away in November 2003 aged 8 years. I still mourn her passing to this very day. Dion was born on the 16th November, 1985 and was bred by Leona Truman (Gott). 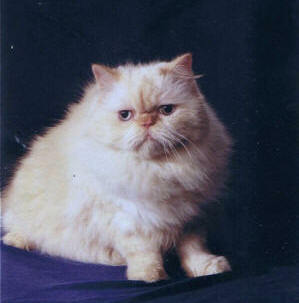 A red colourpoint Persian, Dion had a long, flowing coat and beautiful, gentle nature. 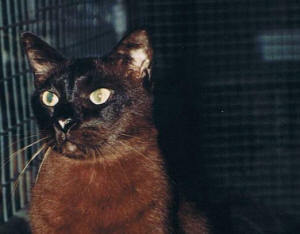 He was the first NT cat to be awarded the title of ACF National Gd Pn. His untimely death in 1996 just days after his 11th birthday is still felt to this day. Oscar wandered into our yard one day and decided this was where he was going to spend the rest of his life! 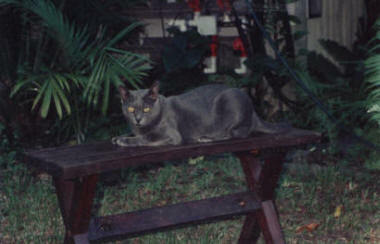 Having never seen a Korat before, I believed him to be a blue Burmese. He was in very poor condition having lived on the street and being in many fights. A vet visit disclosed that he had an abscess on his face which was treated and he was neutered as well. When his condition improved it was obvious he was not a Burmese. Eventually, a person in the Darwin Cat Association put me in contact with the person she believed was Oscar’s breeder and so his breed was confirmed. 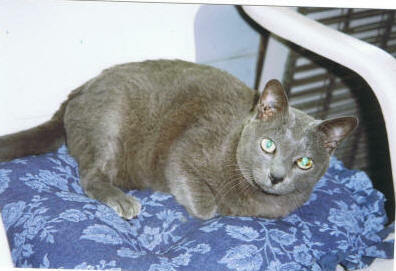 He lived with us until he became ill with renal failure in 1995 at the approximate age of 14 years. We had to make the difficult decision to help him on his journey to a better place. This was a devastating time for us and all who had known him because of his beautiful, unique nature. Little did I know the day Oscar walked into our lives that I would one day become a breeder of this beautiful breed. Thanks for the memories and the inspiration, my darling Oscar. Benny was born in South Australia by Margaret Robinson on 10th August 1985. 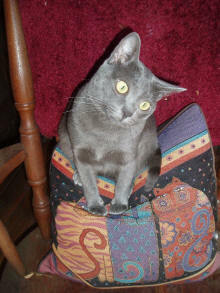 He and his brother Nikki came to live with us in Darwin when they were 4 months old. Benny was my very first cat but because of his gentle, quiet nature it soon became obvious that he did not enjoy the show scene, so he reverted to being a great companion to his “big” brother Nikki. These two lovely boys gave us lots of enjoyment with their athletic antics and loving ways so it was with great shock and much sadness when I discovered that Benny had silently fallen asleep overnight one morning in 1994.